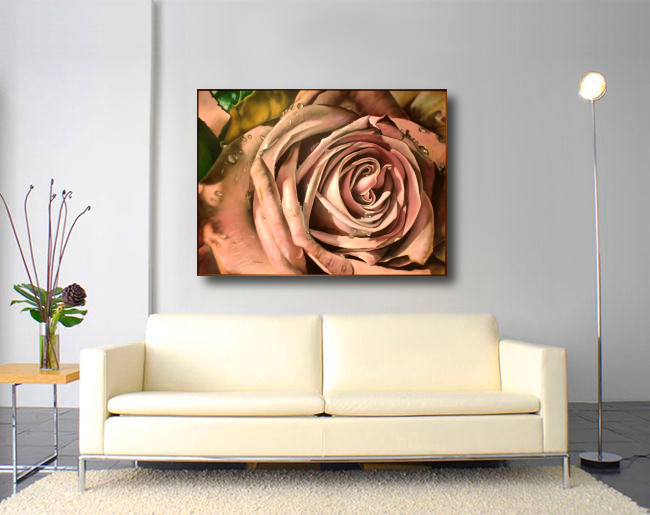 Purple Rose Painting, Antique Rose painting. 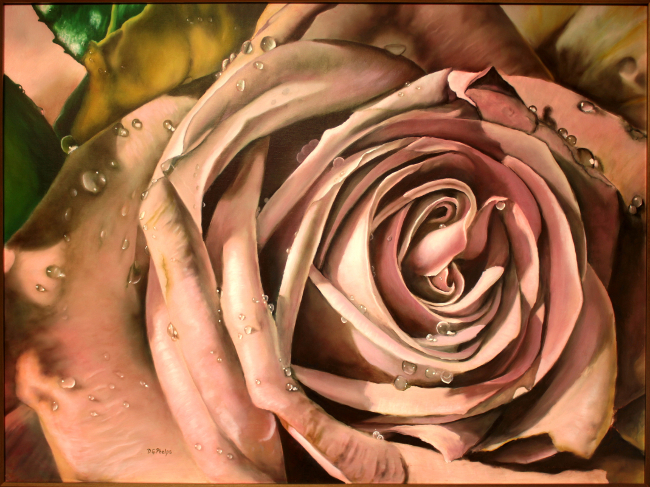 Here we have my antique rose painting. Some say purple, some say violet, but this has a bit of red to it too! It is a very subtle purple, just a hint of it in each petal. And as a male, my eye cannot detect some of the full ranges of purple that are available to the female eye. I hope I have the correct blends of them in this work. I have a very good florist friend that comes along with some very nice finds. Yes, the variety was very fragrant, and I only wish I could grow these. I have painted from the few bushes I try not to kill, but this one was from my friend. And it is a true beauty. Some say it is also a pink. 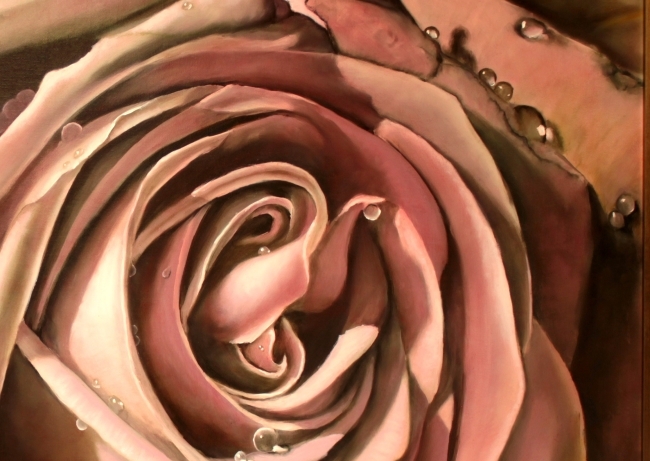 And that is true, there are blends of pinks within the painting. But they lean to the cool rather than the warm side, so I suppose that's why Debbie called this a purple rose. Anyway, I hope you like it and consider it for your space. The link below takes you to the sales page at Etsy where they handle the charge card stuff for me. I really loved the softness and light violet of this rose. The petals turned from a light violet to green on the outside petals, near their edges. 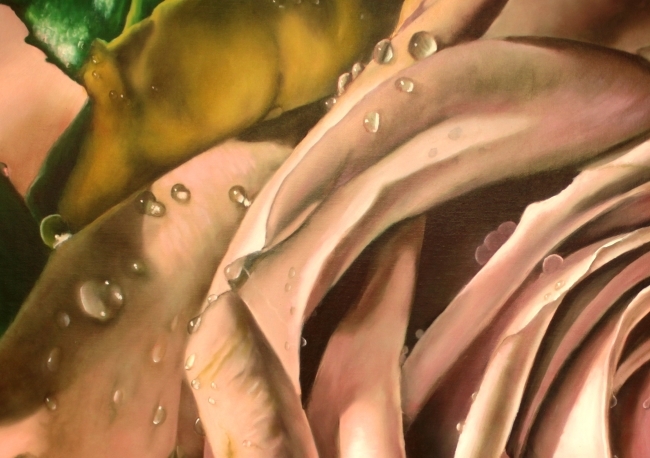 Keep tuned in, as I get time, I'll include some of the process including the dew drops on the left side. It will be on one of the demo pages. This is a 30" x 40" gallery wrapped on canvas oil painting. If you are really interested in purchasing this work, please inquire below. Interested in how this was done? Check here for my painting methods and guarantee to online art buying. The link opens in a new window so you won't lose your place here. If you're a fellow artist, and want to learn more about the process, click here to see exactly how I made this painting. Especially the dew drops throughout. And if that wets your appetite, let me recommend a fantastic electronic workshop manual to you. It shows you step by step how to produce works like this that will simply amaze you, your family and fellow artists! Check around the site more too. Especially "Your painting tips" where folks have submitted their own paintings. You won't believe your eyes with some of the first timers using this method! Back to top of Rose.